What was the Third Plague Pandemic? The Third Plague Pandemic (1855–1959) was unprecedented for a number of reasons. For the first time in history, bubonic plague reached all five continents, striking major cities from Hong Kong (in 1894) to Bombay (1896), Sydney (1900), Cape Town (1901) and Los Angeles (1924). 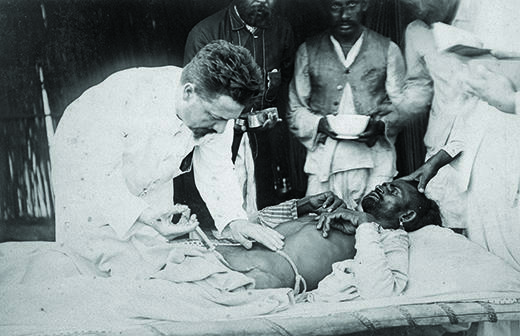 The pandemic left an estimated 12 million dead (including 10 million on the Indian subcontinent), and saw the implementation of extraordinary measures for its containment. The previous two plague pandemics (in 541–42 and 1346–53) had left society baffled as to its origins. Yet by the late 19th century scientists had a far greater understanding of plague – in fact, in Hong Kong in 1894, they were able to isolate the bacillus that caused it. By 1905, scientists had also acknowledged the role of the rat and the flea in plague transmission. Yet these discoveries did little to improve public health measures. 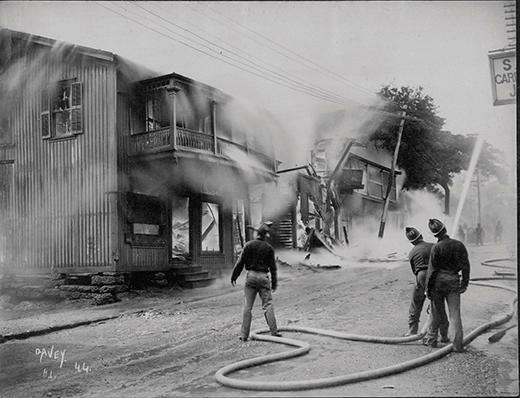 Quarantine, forced evacuations and torching neighbourhoods, such as Honolulu’s Chinatown (1900), were all employed against the pandemic, causing distress and conflict across afflicted areas. As the first epidemic of any infectious disease to be photographed as it travelled across the globe, the pandemic left an extraordinary legacy of visual material. These images reveal the enormous, and diverse, impact of the plague on communities – from attempted regulation through de-roofing of houses and forced segregation, to efforts to control the way in which people dealt with the dead. Plague struck north-east China between 1910 and 1911, killing 60,000; the fatality rate among those infected was 100 per cent. 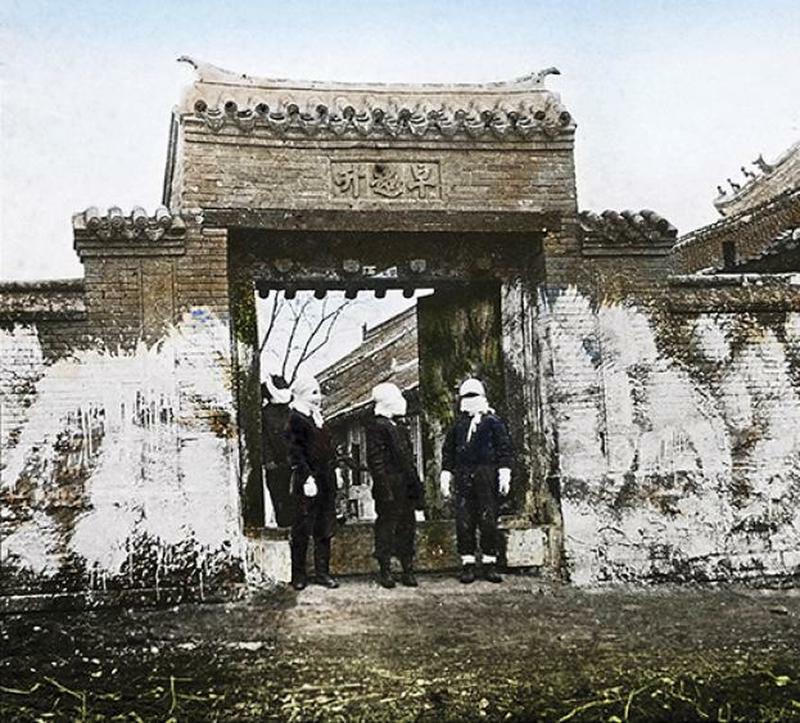 The men shown in the main picture at the gates of Shenyang’s plague hospital have covered their faces with white cloth, and the hospital wall has been whitewashed, probably with a lime solution used as a disinfectant. Improvements in public health reduced casualties in a 1920 outbreak by four-fifths. The arrival of plague in Hong Kong in 1894 saw British colonial authorities and Chinese elites clash over anti-plague measures and treatment of the afflicted. 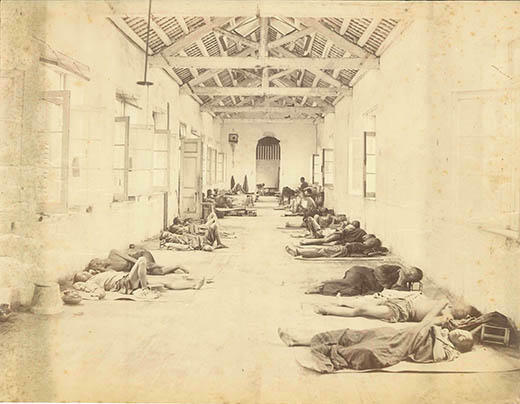 The issue of where to hospitalise patients was a particular bone of contention – as this image, showing patients lying in a makeshift facility at the Kennedy Town Glassworks factory, demonstrates. The open windows reflected a British practice, yet Chinese doctors considered drafts to be lethal. Plague arrived in Honolulu in December 1899. In response, the authorities closed down the harbour and Chinatown. They also burned houses in Chinatown that were deemed to be insanitary, as shown here. On 20 January 1900, the burning of plague-infected buildings in this area of the city got out of control and an area of up to 65 acres went up in flames. Hindu and Muslim funerary rites in India captivated the imaginations of colonial photographers. 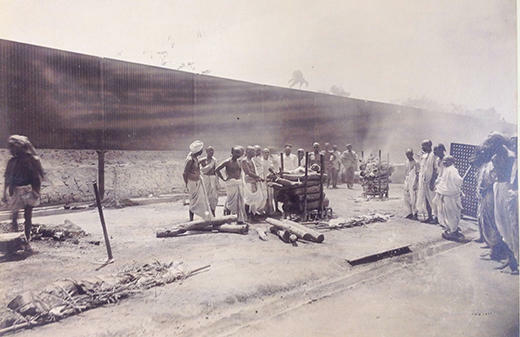 Images such as this, of a Hindu burning ground at Sonapur, littered the pages of the British press, relaying back news of the disease to a Victorian audience fascinated by what was, to them, the exotic social world in which plague was thriving. Paul-Louis Simond – the French doctor who discovered that fleas are responsible for transmitting plague from rats to humans – injects serum into a victim. Serum therapy (which aimed to pass on immunity to the victim) was a contested procedure that sometimes killed the patient. As such, it became a rallying point for Indian resistance to the colonial government’s anti-plague measures. 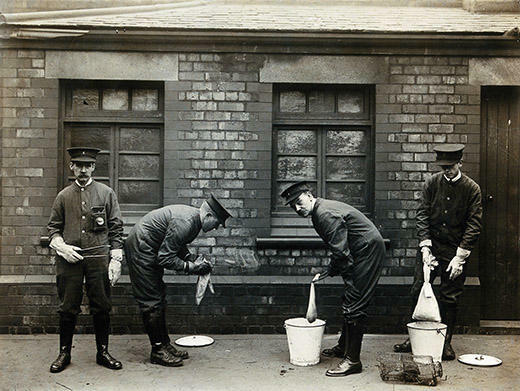 In a bid to prevent the spread of the disease, men of the Liverpool Port Sanitary Authority dip rats into buckets of petrol to kill the fleas. Though there was no widespread outbreak of plague in Britain, deaths were recorded in Cardiff, Glasgow and Suffolk. Cases were also reported in Liverpool, most notably in 1901, 1908, 1914 and 1916. Protective measures were crucial in restricting the spread of plague. 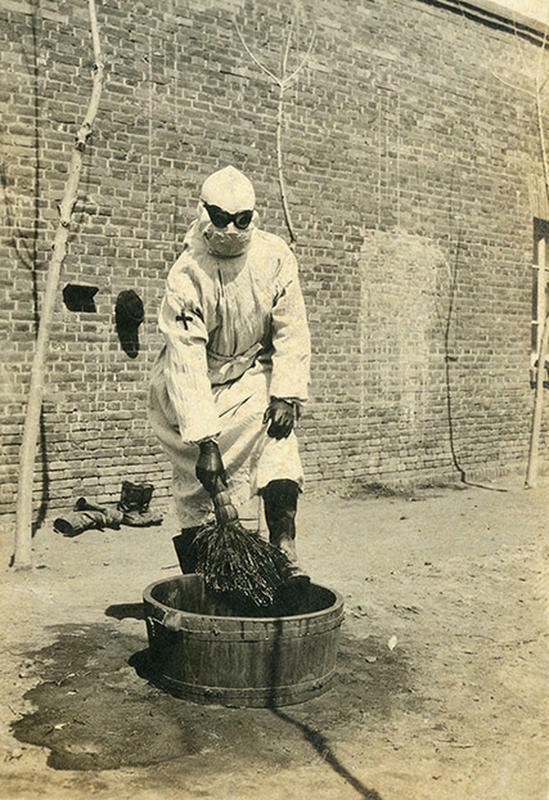 Here, a man in overalls, full face mask, goggles and gloves washes his boots during the 1920–21 epidemic in Harbin that caused 3,000 deaths.